This past week we discovered a new trend among teens with their personal use of technology. While seemingly innocent on the surface, the latest in hidden photo-sharing apps could potentially cause trouble with our youth down the road, especially in the area of “sexting.” While the Eanes ISD staff have taken the necessary precautions to block/restrict these types of apps on our network and devices, students still can engage in misbehavior on their own personal devices which can lead to serious distraction and, even more severely, possible prosecution. Similar to last semester’s issues with the Yik Yak app, we are once again asking for parents to keep an eye out for the following apps (or similar ones) that might be making the rounds on your child’s phone. We are sharing these tools and resources with parents in order to promote discussion around responsible decision making, to correct poor choices, and open up a dialogue between parent and teen about their digital lives. What follows is information about some specific hidden photo-sharing apps, next steps to take, and where to go for help and support as a parent. Keep Safe Private Photo Vault is one of many new “secret vault” type apps making their way through the app stores of Apple and Android. This app is advertised as a way to keep photos and videos safe behind a private PIN and not post them on your public photo roll. The app is easy enough to identify (see icon here) however, if you share iCloud accounts or check your child’s photo roll regularly, you won’t notice it as photos don’t appear there. 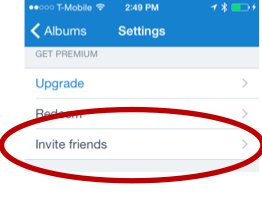 While hiding photos is one issue, our concern is with the “Invite friends” premium feature. With this enabled, kids can potentially share photos privately without anyone knowing. One additional premium feature is called “Secret Door”. This allows you to make the app look like another app. Pressing and holding down on the “fake” app enables the PIN pad. If your child is a Keep Safe Private Photo Vault user, (or a user of other “private vault” type app) a conversation should happen with him/her about why they feel the need to hide their photos and share them privately. If you don’t see the app, but suspect it may have been downloaded, you can also check in the Updates section of the App Store under “Purchased” on your child’s phone. Any apps ever downloaded are stored in there. These apps look innocent and most of the calculator apps actually are real WORKING calculators. However, if you punch in a secret combination of numbers and symbols, you can “unlock” the secret photo compartment hidden behind the calculator. Rather than checking every single app on your child’s device, one quick way to check on an iOS device is to go to Settings->Privacy->Camera. There is a list of every app that uses or has used the camera at one time or another. While deleting the app takes care of the immediate issue, there may be a larger issue at hand when it comes to the use of private photo sharing by your child. Please take this opportunity to have that conversation about how NOTHING on the internet is truly anonymous or temporary. So….Why should I worry about this? Much like with Yik Yak in the fall, it is likely that many students will learn about these apps from friends and be curious to try them. Teens have a certain level of curiosity and experimentation anyway, but with the added peer pressure, it could lead to a more serious issue like “Sexting.” Texas Attorney General Ken Paxton goes into the details of sexting laws in the state on this site. While the majority of these cases are tied to state courts, here is some more information on the federal side of things. Besides those stated above, there are many other apps being made that provide the same service. Here is a Mashable.com post that describes 7 different apps for iOS and Android that are out there to hide photos and videos. Much like social media and kids, the best method of avoiding any type of negative behavior with this technology is openness, awareness and communication with your child. Where Can I Get Help and Support? Common Sense Media always has helpful resources for parents and kids. Here is an article for parents on how to discuss sexting with your teen. Eanes ISD also provides multiple resources and platforms for parents to get assistance or to report any issues that may be discovered down the road. On February 25th we’ll hold our second annual “Parent University” at Riverbend church to discuss these and many other issues with raising kids in the digital age. Click here for more information on Parent University. I also send out a monthly “Digital Parent Gazette” to interested parents to alert them of any concerns and showcase some great examples of how technology is being used in the classroom. To receive this newsletter, sign up here. 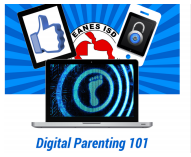 Finally, I’m offering another “Digital Parenting 101” iTunesU course this semester. This is a free 12-week online course offered to the public that covers a variety of topics such as social media, screen time, gaming, and helping your child make a positive digital footprint. The course has already started but it’s not too late to sign up. It officially runs from February 2nd through May 1st. Thank you for taking the time to not only review all this information but also to talk with your child. We know that it may be difficult, but it is important to have an ongoing conversation about social media and digital footprints. If you have any other questions or concerns, please contact either your campus administrators, counselors, or me. It takes a village to raise a child. The more we communicate, the better the learning experience for our kids. 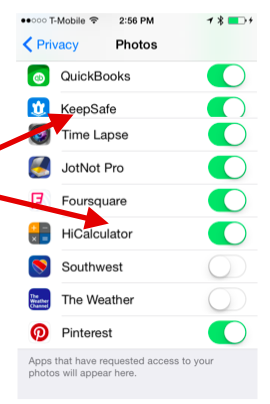 Posted on February 10, 2015, in Apps, Parents, Social Media, Techy and tagged apps, fake calculator, hidden, keep safe, mobile devices, parent awareness, parents, photo sharing, secret, social media, technology, teens. Bookmark the permalink. 1 Comment.